After age 30, muscle mass declines at a rate of 3 to 5 percent each decade, according to Harvard Health Publishing. Do the math and you can see where you stand at age 50 if you've been living a sedentary lifestyle. But don't panic. It's never too late to start a muscle-building exercise routine. If you choose the right program and stick to it, you'll reap the benefits of increased lean muscle mass in no time. Any weight-bearing activity can help you build muscle at age 50. Building lean muscle mass at any age can give you a new lease on life. Most important, you'll grow stronger and feel better able to handle the tasks of daily living. You won't get fatigued as easily performing chores; even just carrying your own body weight around all day will feel easier. Lean muscle mass also helps you burn fat. The more lean muscle mass and the less fat you have, the more calories you'll burn each day even if your diet doesn't change. That's because muscle is more metabolically active; it takes about four times the energy to build and maintain muscle mass as it does fat. If "middle-age spread" has made its mark, you can reign it in by building muscle after 50. Improved bone density and bone strength. Bones become weaker and more susceptible to fractures as you age. Weight-bearing exercises prevent bone loss and stimulate bone growth. Improved heart health. Strength training can get your heart rate up just as much as cardiovascular exercise. Improved self-image and self-confidence. You'll look better and feel better. You'll also feel a sense of accomplishment and mastery from working out and building muscle. Improved sleep. Both cardiovascular and strength-training exercise improve sleep. Just keep in mind that when you starting hitting the weights you might need more shut-eye. Your body needs that time to repair and recover. Improved brain function. A 2016 study in Clinical Interventions in Aging found that 12 weeks of resistance training improved cognitive capacity in older women by 19 percent. There is no single best workout program for a 50-year-old man. In fact, any activity you do that's weight bearing builds muscle. Examples include brisk walking, stair-climbing, hiking, pushing a lawnmower, doing aerobics, jumping rope, doing calisthenics, weightlifting and playing tennis. All that matters is that you engage in the activity with enough intensity and frequency. To understand why, it's helpful to know the basics about muscle building. Gaining muscle mass actually starts by breaking it down. When you do challenging activities that use your muscles, the muscle fibers undergo microscopic tears. After the activity, your body goes to work to repair this damage by synthesizing new muscle protein. When muscle protein synthesis exceeds muscle breakdown, you gain muscle mass. So, all you need to do is tax your muscles? It's a little more complicated than that. To build muscle over time, you need to tax your muscles at the right frequency — meaning the number of times per week — and at the right intensity, meaning you need to do enough damage. But that's not all. Because your muscles adapt to stress by growing stronger, you will need to gradually increase the intensity of your activities. This will stimulate the body to continue to adapt and build more muscle. Lifting weights is the most direct route to building muscle after 50, and it's a nice complement to any of the other muscle-building activities you like to do. Weight training makes it easier to track your gains in strength, and getting stronger and increasing the weight you lift is a tangible measure of accomplishment. If you've never lifted weights before, figuring out what to do can seem a bit daunting. But it doesn't have to be very complex. In the beginning, you only need to focus on a few moves and on getting the technique right and developing muscle memory. At this point, it doesn't matter how much weight you lift or if you lift any at all. Many of these exercises use several muscle groups at a time. The deadlift activates all the muscles in the lower body as well as the arms, back and abs. You can get a complete total-body workout doing as few as five of these exercises. For the first month of your program, focus on learning these moves with very light weight. Watch videos online, or better yet, hire a personal trainer for a few sessions to demonstrate proper technique and design a program for you. Start with one or two sets of 12 repetitions of each exercise. Then increase to two to three sets of each exercise you choose to do. By the last few reps of each set, your muscles should feel quite fatigued. As you become more experienced, you'll learn how to push yourself a little farther to increase your gains. In the beginning, just do what's manageable for you. Building a routine that lasts is much easier when it doesn't feel stressful or like you're forced to do something you don't want to do. Make it into the gym, or to your other activities of choice, at least three times per week. As you become more experienced, you may want to work out more often. As far as efficacy goes, a 2016 study in Sports Medicine concluded that lifting weights twice a week for each major muscle group was more effective than only lifting weights once a week. That means that if you are doing upper body one day and lower body another day, you would want to lift four days a week. Muscle growth occurs after you've lifted weight, not while you are lifting. So it's important to give your body plenty of time to do its work. As you increase the intensity of your workout, you will need more rest time in between sessions — up to 72 hours. Spacing workouts that train the same muscle group at least 48 hours apart is a good goal. Getting adequate sleep (7 to 9 hours) and proper nutrition will aid recovery and muscle growth. 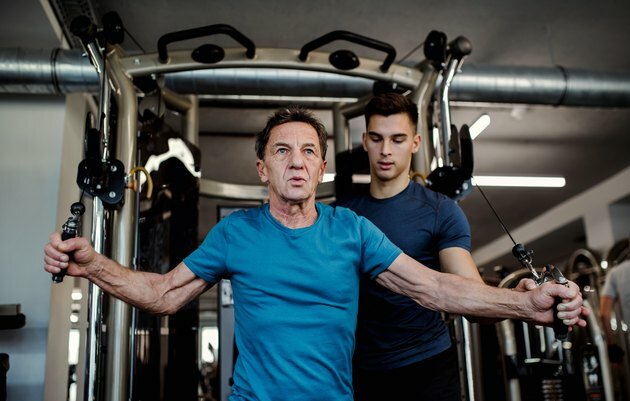 According to a 2016 study in The American Journal of Clinical Nutrition, a higher protein intake, with protein evenly distributed among meals, is associated with increased levels of muscle mass in older adults. Give yourself a few weeks before you start increasing the weight load. Your body works very hard to adapt in these first few weeks and if you do too much too soon, the rate of muscle breakdown may exceed the rate of muscle protein synthesis, which is counterproductive. Also, starting out slow will reduce some of the discomfort of delayed-onset muscle soreness (DOMS) that you may experience for one to four days after your workout. This normal response to the stress of resistance training is often worse when you are just starting a program; as you get stronger, you'll likely find that DOMS is much less noticeable — or you might not notice it all. But once you've got the technique down, it's time to further challenge your body. Increase the weight you lift by a few pounds once the exercise is getting too easy at the previous weight. Do it gradually. Being conservative with adding weight won't keep you from building muscle, but it will prevent you from becoming injured. How Often Can I Train a Muscle Group to Gain Mass? How Much Time Should I Spend Lifting Weights?